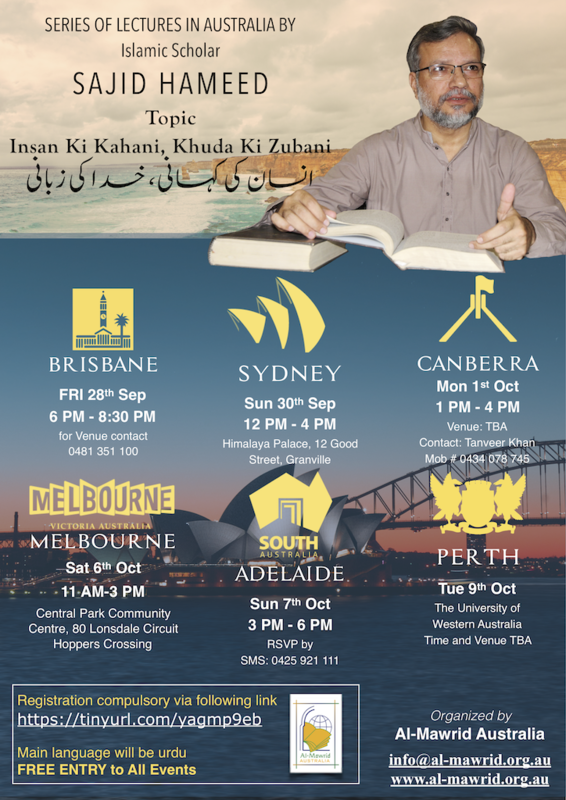 Prof Sajid Hameed, an eminent scholar and Director of Education of Al-Mawrid, will be visiting Australia later this month for a series of lectures in various cities. He has been a student of renowned Islamic scholar, Javed Ahmad Ghamidi for over 30 years. Prof Sajid's research interests include Qur'an and Hadith, Arabic language, Islamic jurisprudence and philosophy. He has also been teaching in various prestigious universities in Lahore. He has written a number of books such is 'What is Mistrust? ', 'What is perseverance: How to achieve it? ', 'Why do we encounter difficulties in life? ', to name a few. He has also published numerous articles in research journals including in 'Ishraq'- a research journal published by Javed Ahmad Ghamidi. He is currently developing a comprehensive syllabus for Al-Mawrid to cater to the education needs of various age groups from primary all the way up to tertiary level.